Search results: Simply click on any photo below for more information. Other options include Detail View, List View, or Change Selection (above). Listing by One Percent Realty Ltd. Listing by Hanna Realty Ltd. Listing by Stonehaus Realty Corp. Listing by Royal Pacific Realty Corp.
Captain Vancouver.com is the central hub for the network of websites in Captain Vancouver's Real Estate Network. You can do a general search for any type of home in the greater Vancouver area by going to 604 YOUR KEY.COM or narrow down your home search by neighbourhood or by the type of property from one of the links below. Call us if you are looking to buy a home, remember buyers pay nothing for our professional services. 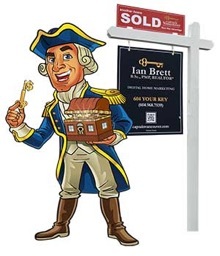 Ian will meet with you, arrange viewings of homes that match your needs, negotiate the best price, and complete all sales and contract details for you. Disclaimer: The data relating to real estate on this web site comes in part from the MLS® Reciprocity program of the Real Estate Board of Greater Vancouver, and the Fraser Valley Real Estate Board. Real estate listings held by participating real estate firms are marked with the MLS® logo and detailed information about the listing includes the name of the listing brokerage. This representation is based in whole or part on data generated by the Real Estate Board of Greater Vancouver, and the Fraser Valley Real Estate Board who assume no responsibility for its accuracy. The materials contained on this page may not be reproduced without the express written consent of the Real Estate Board of Greater Vancouver, The Fraser Valley Real Eztate Board, and Ian Brett. We make every effort to ensure that the information and data contained on this website is correct. However, we cannot accept liability or guarantee that the information and data provided is up-to-date, correct and complete. This also applies for all other websites referred to by means of a hyperlink. Nor is Ian Brett responsible for the contents of such websites reached by means of such a link. We reserve the right to modify or supplement the information or data provided without prior notice. *FREE Realtor® representation for BUYERS and SELLERS get cash back* My fees are paid out the sellers commission that is shared between buyer and sellers agent. Sellers who list their homes for sale with me will get cash back.